Some pretty patterns helps set this Mallory coin purse from Amy Butler apart. Amy Butler offers us an impressive 11 prints, but I think this cotton vine navy one is my favorite. Given its name I guess those pale yellow shapes are heads of cotton, but they're so abstract that they could easily be mistaken for flowers. Whatever they are, I love the way they pop against the navy blue background. Whichever pattern you pick, you'll appreciate the Mallory's soft organic cotton body. It doesn't just feel good to touch; it's also good for the environment, so carrying it should make you feel even better! The attention to detail is impressive for such a small purse. I really like the fabric covered frame, reinforced piping, and pretty floral cotton lined interior. Coin purses are so tiny that there's not really a lot of space to add extras, but Amy Butler's worked hard to offer value here. And well she should, because at $36 this is definitely on the high side. Personally I think this is a case of paying a premium for sustainable materials, which is disappointing. However it's so cute that I'm finding the price gouging a little easier to forgive! 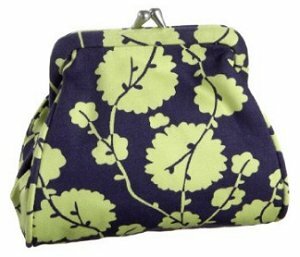 The Vera Bradley Double Kiss coin purse, a great alternative to this kiss-lock bag.